Not to be confused with iPad or AirPods. "IPOD" redirects here. For other uses, see IPOD (disambiguation). This article is about the series. For a specific iPod, see iPod Touch, iPod Classic, iPod Mini, iPod Nano and iPod Shuffle. iPod line before July 27, 2017. From left to right: iPod Shuffle, iPod Nano, iPod Touch. The iPod is a line of portable media players and multi-purpose pocket computers designed and marketed by Apple Inc. The first version was released on October 23, 2001, about ​8 1⁄2 months after the Macintosh version of iTunes was released. As of July 27, 2017, only the iPod Touch (sixth generation) remains in production. Like other digital music players, iPods can serve as external data storage devices. Apple's iTunes software (and other alternative software) can be used to transfer music, photos, videos, games, contact information, e-mail settings, Web bookmarks, and calendars, to the devices supporting these features from computers using certain versions of Apple macOS and Microsoft Windows operating systems. Before the release of iOS 5, the iPod branding was used for the media player included with the iPhone and iPad, a combination of the Music and Videos apps on the iPod Touch. As of iOS 5, separate apps named "Music" and "Videos" are standardized across all iOS-powered products. While the iPhone and iPad have essentially the same media player capabilities as the iPod line, they are generally treated as separate products. During the middle of 2010, iPhone sales overtook those of the iPod. The iPod was released in late 2001. The iPod line came from Apple's "digital hub" category, when the company began creating software for the growing market of personal digital devices. Digital cameras, camcorders and organizers had well-established mainstream markets, but the company found existing digital music players "big and clunky or small and useless" with user interfaces that were "unbelievably awful," so Apple decided to develop its own. As ordered by CEO Steve Jobs, Apple's hardware engineering chief Jon Rubinstein assembled a team of engineers to design the iPod line, including hardware engineers Tony Fadell and Michael Dhuey, and design engineer Sir Jonathan Ive. Rubinstein had already discovered the Toshiba hard disk drive while meeting with an Apple supplier in Japan, and purchased the rights to it for Apple, and had also already worked out how the screen, battery, and other key elements would work. The aesthetic was inspired by the 1958 Braun T3 transistor radio designed by Dieter Rams, while the wheel-based user interface was prompted by Bang & Olufsen's BeoCom 6000 telephone. The product ("the Walkman of the twenty-first century" ) was developed in less than one year and unveiled on October 23, 2001. Jobs announced it as a Mac-compatible product with a 5 GB hard drive that put "1,000 songs in your pocket." Apple did not develop the iPod software entirely in-house, instead using PortalPlayer's reference platform based on two ARM cores. The platform had rudimentary software running on a commercial microkernel embedded operating system. PortalPlayer had previously been working on an IBM-branded MP3 player with Bluetooth headphones. Apple contracted another company, Pixo, to help design and implement the user interface under the direct supervision of Steve Jobs. As development progressed, Apple continued to refine the software's look and feel. Starting with the iPod Mini, the Chicago font was replaced with Espy Sans. Later iPods switched fonts again to Podium Sans—a font similar to Apple's corporate font, Myriad. Color display iPods then adopted some Mac OS X themes like Aqua progress bars, and brushed metal meant to evoke a combination lock. In 2007, Apple modified the iPod interface again with the introduction of the sixth-generation iPod Classic and third-generation iPod Nano by changing the font to Helvetica and, in most cases, splitting the screen in half by displaying the menus on the left and album artwork, photos, or videos on the right (whichever was appropriate for the selected item). In 2006 Apple presented a special edition for iPod 5G of Irish rock band U2. Like its predecessor, this iPod has engraved the signatures of the four members of the band on its back, but this one was the first time the company changed the colour of the metal (not silver but black). This iPod was only available with 30GB of storage capacity. The special edition entitled purchasers to an exclusive video with 33 minutes of interviews and performance by U2, downloadable from the iTunes Store. In September 2007, during a lawsuit with patent holding company Burst.com, Apple drew attention to a patent for a similar device that was developed in 1979. Kane Kramer applied for a UK patent for his design of a "plastic music box" in 1981, which he called the IXI. He was unable to secure funding to renew the US$120,000 worldwide patent, so it lapsed and Kramer never profited from his idea. The name iPod was proposed by Vinnie Chieco, a freelance copywriter, who (with others) was called by Apple to figure out how to introduce the new player to the public. After Chieco saw a prototype, he thought of the movie 2001: A Space Odyssey and the phrase "Open the pod bay doors, Hal", which refers to the white EVA Pods of the Discovery One spaceship. Chieco saw an analogy to the relationship between the spaceship and the smaller independent pods in the relationship between a personal computer and the music player. Apple researched the trademark and found that it was already in use. Joseph N. Grasso of New Jersey had originally listed an "iPod" trademark with the U.S. Patent and Trademark Office (USPTO) in July 2000 for Internet kiosks. The first iPod kiosks had been demonstrated to the public in New Jersey in March 1998, and commercial use began in January 2000, but had apparently been discontinued by 2001. The trademark was registered by the USPTO in November 2003, and Grasso assigned it to Apple Computer, Inc. in 2005. The earliest recorded use in commerce of an "iPod" trademark was in 1991 by Chrysalis Corp. of Sturgis, Michigan, styled "iPOD". In mid-2015, several new color schemes for all of the current iPod models were spotted in the latest version of iTunes, 12.2. Belgian website Belgium iPhone originally found the images when plugging in an iPod for the first time, and subsequent leaked photos were found by Pierre Dandumont. On July 27, 2017, Apple removed the iPod Nano and Shuffle from its stores, marking the end of Apple producing standalone music players. Currently, the iPod Touch is the only iPod produced by Apple. iPod Classic 6th generation, iPod Nano 2nd generation onwards, iPod Shuffle 2nd generation onwards Samsung System-on-a-chip, based around an ARM processor. iPod Shuffle 1st generation SigmaTel D-Major STMP3550 chip running at 75 MHz that handles both the music decoding and the audio circuitry. iPod Touch 1st and 2nd generation ARM 1176JZ(F)-S at 412 MHz for 1st gen, 533 MHz for 2nd gen. The third-generation iPod had a weak bass response, as shown in audio tests. The combination of the undersized DC-blocking capacitors and the typical low impedance of most consumer headphones form a high-pass filter, which attenuates the low-frequency bass output. Similar capacitors were used in the fourth-generation iPods. The problem is reduced when using high-impedance headphones and is completely masked when driving high-impedance (line level) loads, such as an external headphone amplifier. The first-generation iPod Shuffle uses a dual-transistor output stage, rather than a single capacitor-coupled output, and does not exhibit reduced bass response for any load. For all iPods released in 2006 and earlier, some equalizer (EQ) sound settings would distort the bass sound far too easily, even on undemanding songs. This would happen for EQ settings like R&B, Rock, Acoustic, and Bass Booster, because the equalizer amplified the digital audio level beyond the software's limit, causing distortion (clipping) on bass instruments. From the fifth-generation iPod on, Apple introduced a user-configurable volume limit in response to concerns about hearing loss. Users report that in the sixth-generation iPod, the maximum volume output level is limited to 100 dB in EU markets. Apple previously had to remove iPods from shelves in France for exceeding this legal limit. However, users who have bought a new sixth-generation iPod in late 2013 have reported a new option that allowed them to disable the EU volume limit. It has been said that these new iPods came with an updated software that allowed this change. Older sixth-generation iPods, however, are unable to update to this software version. Originally, a FireWire connection to the host computer was used to update songs or recharge the battery. The battery could also be charged with a power adapter that was included with the first four generations. The third generation began including a 30-pin dock connector, allowing for FireWire or USB connectivity. This provided better compatibility with non-Apple machines, as most of them did not have FireWire ports at the time. Eventually Apple began shipping iPods with USB cables instead of FireWire, although the latter was available separately. As of the first-generation iPod Nano and the fifth-generation iPod Classic, Apple discontinued using FireWire for data transfer (while still allowing for use of FireWire to charge the device) in an attempt to reduce cost and form factor. As of the second-generation iPod Touch and the fourth-generation iPod Nano, FireWire charging ability has been removed. The second-, third-, and fourth-generation iPod Shuffle uses a single 3.5 mm minijack phone connector which acts as both a headphone jack or a USB data and charging port for the dock/cable. The dock connector also allowed the iPod to connect to accessories, which often supplement the iPod's music, video, and photo playback. Apple sells a few accessories, such as the now-discontinued iPod Hi-Fi, but most are manufactured by third parties such as Belkin and Griffin. Some peripherals use their own interface, while others use the iPod's own screen. Because the dock connector is a proprietary interface, the implementation of the interface requires paying royalties to Apple. Apple introduced a new 8-pin dock connector, named Lightning, on September 12, 2012 with their announcement of the iPhone 5, the fifth-generation iPod Touch, and the seventh-generation iPod Nano, which all feature it. The new connector replaces the older 30-pin dock connector used by older iPods, iPhones, and iPads. Apple Lightning cables have pins on both sides of the plug so it can be inserted with either side facing up. Bluetooth connectivity was added to the last model of the iPod Nano, and Wi-Fi to the iPod Touch. Two early designs of iPod earphones. Many accessories have been made for the iPod line. A large number are made by third party companies, although many, such as the iPod Hi-Fi, are made by Apple. Some accessories add extra features that other music players have, such as sound recorders, FM radio tuners, wired remote controls, and audio/visual cables for TV connections. Other accessories offer unique features like the Nike+iPod pedometer and the iPod Camera Connector. Other notable accessories include external speakers, wireless remote controls, protective case, screen films, and wireless earphones. Among the first accessory manufacturers were Griffin Technology, Belkin, JBL, Bose, Monster Cable, and SendStation. BMW released the first iPod automobile interface, allowing drivers of newer BMW vehicles to control an iPod using either the built-in steering wheel controls or the radio head-unit buttons. Apple announced in 2005 that similar systems would be available for other vehicle brands, including Mercedes-Benz, Volvo, Nissan, Toyota, Alfa Romeo, Ferrari, Acura, Audi, Honda, Renault, Infiniti and Volkswagen. Scion offers standard iPod connectivity on all their cars. Some independent stereo manufacturers including JVC, Pioneer, Kenwood, Alpine, Sony, and Harman Kardon also have iPod-specific integration solutions. Alternative connection methods include adapter kits (that use the cassette deck or the CD changer port), audio input jacks, and FM transmitters such as the iTrip—although personal FM transmitters are illegal in some countries. Many car manufacturers have added audio input jacks as standard. Beginning in mid-2007, four major airlines, United, Continental, Delta, and Emirates, reached agreements to install iPod seat connections. The free service will allow passengers to power and charge an iPod, and view video and music libraries on individual seat-back displays. Originally KLM and Air France were reported to be part of the deal with Apple, but they later released statements explaining that they were only contemplating the possibility of incorporating such systems. The iPod line can play several audio file formats including MP3, AAC/M4A, Protected AAC, AIFF, WAV, Audible audiobook, and Apple Lossless. The iPod Photo introduced the ability to display JPEG, BMP, GIF, TIFF, and PNG image file formats. Fifth- and sixth-generation iPod Classics, as well as third-generation iPod Nanos, can additionally play MPEG-4 (H.264/MPEG-4 AVC) and QuickTime video formats, with restrictions on video dimensions, encoding techniques and data rates. Originally, iPod software only worked with Classic Mac OS and macOS; iPod software for Microsoft Windows was launched with the second-generation model. Unlike most other media players, Apple does not support Microsoft's WMA audio format—but a converter for WMA files without digital rights management (DRM) is provided with the Windows version of iTunes. MIDI files also cannot be played, but can be converted to audio files using the "Advanced" menu in iTunes. Alternative open-source audio formats, such as Ogg Vorbis and FLAC, are not supported without installing custom firmware onto an iPod (e.g., Rockbox). During installation, an iPod is associated with one host computer. Each time an iPod connects to its host computer, iTunes can synchronize entire music libraries or music playlists either automatically or manually. Song ratings can be set on an iPod and synchronized later to the iTunes library, and vice versa. A user can access, play, and add music on a second computer if an iPod is set to manual and not automatic sync, but anything added or edited will be reversed upon connecting and syncing with the main computer and its library. If a user wishes to automatically sync music with another computer, an iPod's library will be entirely wiped and replaced with the other computer's library. iPods with color displays use anti-aliased graphics and text, with sliding animations. All iPods (except the 3rd-generation iPod Shuffle, the 6th & 7th generation iPod Nano, and iPod Touch) have five buttons and the later generations have the buttons integrated into the click wheel – an innovation that gives an uncluttered, minimalist interface. The buttons perform basic functions such as menu, play, pause, next track, and previous track. Other operations, such as scrolling through menu items and controlling the volume, are performed by using the click wheel in a rotational manner. The 3rd-generation iPod Shuffle does not have any controls on the actual player; instead it has a small control on the earphone cable, with volume-up and -down buttons and a single button for play and pause, next track, etc. The iPod Touch has no click-wheel; instead it uses a touch screen along with a home button, sleep/wake button and (on the second and third generations of the iPod Touch) volume-up and -down buttons. The user interface for the iPod Touch is identical to that of the iPhone. Differences include the lack of a phone application. Both devices use iOS. The iTunes Store (introduced April 29, 2003) is an online media store run by Apple and accessed through iTunes. The store became the market leader soon after its launch and Apple announced the sale of videos through the store on October 12, 2005. Full-length movies became available on September 12, 2006. At the time the store was introduced, purchased audio files used the AAC format with added encryption, based on the FairPlay DRM system. Up to five authorized computers and an unlimited number of iPods could play the files. Burning the files with iTunes as an audio CD, then re-importing would create music files without the DRM. The DRM could also be removed using third-party software. However, in a deal with Apple, EMI began selling DRM-free, higher-quality songs on the iTunes Stores, in a category called "iTunes Plus." While individual songs were made available at a cost of US$1.29, 30¢ more than the cost of a regular DRM song, entire albums were available for the same price, US$9.99, as DRM encoded albums. On October 17, 2007, Apple lowered the cost of individual iTunes Plus songs to US$0.99 per song, the same as DRM encoded tracks. On January 6, 2009, Apple announced that DRM has been removed from 80% of the music catalog, and that it would be removed from all music by April 2009.
iPods cannot play music files from competing music stores that use rival-DRM technologies like Microsoft's protected WMA or RealNetworks' Helix DRM. Example stores include Napster and MSN Music. RealNetworks claims that Apple is creating problems for itself by using FairPlay to lock users into using the iTunes Store. Steve Jobs stated that Apple makes little profit from song sales, although Apple uses the store to promote iPod sales. However, iPods can also play music files from online stores that do not use DRM, such as eMusic or Amie Street. Universal Music Group decided not to renew their contract with the iTunes Store on July 3, 2007. Universal will now supply iTunes in an 'at will' capacity. Apple debuted the iTunes Wi-Fi Music Store on September 5, 2007, in its Media Event entitled "The Beat Goes On...". This service allows users to access the Music Store from either an iPhone or an iPod Touch and download songs directly to the device that can be synced to the user's iTunes Library over a WiFi connection, or, in the case of an iPhone, the telephone network. Video games are playable on various versions of iPods. The original iPod had the game Brick (originally invented by Apple's co-founder Steve Wozniak) included as an easter egg hidden feature; later firmware versions added it as a menu option. Later revisions of the iPod added three more games: Parachute, Solitaire, and Music Quiz. In September 2006, the iTunes Store began to offer additional games for purchase with the launch of iTunes 7, compatible with the fifth generation iPod with iPod software 1.2 or later. Those games were: Bejeweled, Cubis 2, Mahjong, Mini Golf, Pac-Man, Tetris, Texas Hold 'Em, Vortex, Asphalt 4: Elite Racing and Zuma. Additional games have since been added. These games work on the 6th and 5th generation iPod Classic and the 5th and 4th generation iPod Nano. With third parties like Namco, Square Enix, Electronic Arts, Sega, and Hudson Soft all making games for the iPod, Apple's MP3 player has taken steps towards entering the video game handheld console market. Even video game magazines like GamePro and EGM have reviewed and rated most of their games as of late. The games are in the form of .ipg files, which are actually .zip archives in disguise. When unzipped, they reveal executable files along with common audio and image files, leading to the possibility of third party games. Apple has not publicly released a software development kit (SDK) for iPod-specific development. Apps produced with the iPhone SDK are compatible only with the iOS on the iPod Touch and iPhone, which cannot run clickwheel-based games. All iPods except for the iPod Touch can function in "disk mode" as mass storage devices to store data files but this may not be the default behavior. If an iPod is formatted on a Mac OS computer, it uses the HFS+ file system format, which allows it to serve as a boot disk for a Mac computer. If it is formatted on Windows, the FAT32 format is used. With the release of the Windows-compatible iPod, the default file system used on the iPod line switched from HFS+ to FAT32, although it can be reformatted to either file system (excluding the iPod Shuffle which is strictly FAT32). Generally, if a new iPod (excluding the iPod Shuffle) is initially plugged into a computer running Windows, it will be formatted with FAT32, and if initially plugged into a Mac running Mac OS it will be formatted with HFS+. Unlike many other MP3 players, simply copying audio or video files to the drive with a typical file management application will not allow an iPod to properly access them. The user must use software that has been specifically designed to transfer media files to iPods, so that the files are playable and viewable. Usually iTunes is used to transfer media to an iPod, though several alternative third-party applications are available on a number of different platforms. iTunes 7 and above can transfer purchased media of the iTunes Store from an iPod to a computer, provided that computer containing the DRM protected media is authorized to play it. Media files are stored on an iPod in a hidden folder, along with a proprietary database file. The hidden content can be accessed on the host operating system by enabling hidden files to be shown. The media files can then be recovered manually by copying the files or folders off the iPod. Many third-party applications also allow easy copying of media files off of an iPod. While the suffix "Classic" was not introduced until the sixth generation, it has been applied here retroactively to all generic iPods for clarity. First model, with mechanical scroll wheel. 10 GB model released later. Touch-sensitive wheel. FireWire port had a cover. Hold switch revised. Windows compatibility through Musicmatch. First complete redesign with all-touch interface, dock connector, 4-pin remote connector and slimmer case. Musicmatch support dropped with later release of iTunes 4.1 for Windows. Adopted Click Wheel from iPod Mini, added charging through USB in addition to FireWire. Premium spin-off of 4th generation iPod with color screen, plus picture viewing. Later reintegrated into main iPod line. Second full redesign with a slimmer case, and larger screen with video playback. Remote connector near the headphone jack was omitted as was syncing through FireWire. Offered in black or white. Hardware and firmware updated with 60 GB model replaced with 80 GB model on September 12, 2006. Introduced the "Classic" suffix. New interface and anodized aluminum front plate. Silver replaces white. In September 2008 the hardware and firmware was updated with a 120 GB model replacing the 80 GB model and the 160 GB model was discontinued. In September 2009, the 120 GB model was replaced with a 160 GB model. Discontinued on September 9, 2014. New smaller model, available in 5 colors. Introduced the "Click Wheel". Brighter color variants with longer battery life. Click Wheel lettering matched body color. Gold color discontinued. Later replaced by iPod Nano. Replaced Mini. Available in black or white and used flash memory. Color screen for picture viewing. 1 GB version released later. 2" QVGA screen, colors refreshed with chrome back, new interface, video capability, smaller Click Wheel. Reverted to tall form factor and all-aluminum enclosure with nine color choices, added accelerometer for "shake to shuffle" functionality and horizontal viewing. 4 GB model limited release in selected markets. First iPod to include a video camera; also included a larger screen, FM radio, speaker, pedometer, and a polished exterior case while retaining similar colors to the 4th generation model. First iPod Nano to include multi-touch screen; clip from iPod Shuffle added. Video playback, speakers and camera removed. Reverted to tall form factor with larger 2.5" multi-touch screen. Clip removed. Video playback restored and Bluetooth added. Replaced 30-pin dock connector with new Lightning connector. Discontinued July 27, 2017. New entry-level model. Uses flash memory and has no screen. Smaller clip design with anodized aluminum casing. 4 color options added later. Colors were changed in 2007 and 2008. Smaller design with controls relocated to right earbud cable. Introduced with two colors, and featured VoiceOver. More colors and 2 GB model added in September 2009. Controls returned to the body of the iPod. Introduced with five colors, and featured VoiceOver. Discontinued July 27, 2017. First iPod with Wi-Fi and a Multi-touch interface. Features Safari browser and wireless access to the iTunes Store and YouTube. 32 GB model later added. iOS 2.0 and App Store access required an upgrade fee. New tapered chrome back with Nike+ functionality, volume buttons, and built-in speaker added. iOS 2.0 and App Store access standard. Bluetooth support added but not made active until iOS 3.0, which required an upgrade fee. Updated to include the upgraded internals from the iPhone 3GS; included Voice Control support and bundled remote earphones. New thinner design including two cameras for FaceTime and HD video recording, hold button moved to top right corner, Retina Display similar to iPhone 4, Apple A4 chip. White-colored version added on October 4, 2011. New aluminum design with colored case options. Featured improved cameras along with A5 processor, Siri, and taller 4" Retina Display. First 16 GB models released have no color choices and no iSight camera, In early 2014 16 GB models were released that featured iSight cameras and color choices. Updated with a new lineup of six colors, a new 128 GB model, and improved internals. The improved internals feature new cameras and the A8 processor with M8 motion coprocessor, 1 GB of RAM (twice the amount of the previous generation), and 802.11ac Wi-Fi. In 2005, Apple faced two lawsuits claiming patent infringement by the iPod line and its associated technologies: Advanced Audio Devices claimed the iPod line breached its patent on a "music jukebox", while a Hong Kong-based IP portfolio company called Pat-rights filed a suit claiming that Apple's FairPlay technology breached a patent issued to inventor Ho Keung Tse. The latter case also includes the online music stores of Sony, RealNetworks, Napster, and Musicmatch as defendants. Apple's application to the United States Patent and Trademark Office for a patent on "rotational user inputs", as used on the iPod interface, received a third "non-final rejection" (NFR) in August 2005. Also in August 2005, Creative Technology, one of Apple's main rivals in the MP3 player market, announced that it held a patent on part of the music selection interface used by the iPod line, which Creative Technology dubbed the "Zen Patent", granted on August 9, 2005. On May 15, 2006, Creative filed another suit against Apple with the United States District Court for the Northern District of California. Creative also asked the United States International Trade Commission to investigate whether Apple was breaching U.S. trade laws by importing iPods into the United States. On August 24, 2006, Apple and Creative announced a broad settlement to end their legal disputes. Apple will pay Creative US$100 million for a paid-up license, to use Creative's awarded patent in all Apple products. As part of the agreement, Apple will recoup part of its payment, if Creative is successful in licensing the patent. Creative then announced its intention to produce iPod accessories by joining the Made for iPod program. iPod quarterly sales. Click for table of data and sources. Note that Q1 is October through December of previous year, the holiday season. Since October 2004, the iPod line has dominated digital music player sales in the United States, with over 90% of the market for hard drive-based players and over 70% of the market for all types of players. During the year from January 2004 to January 2005, the high rate of sales caused its U.S. market share to increase from 31% to 65% and in July 2005, this market share was measured at 74%. In January 2007 the iPod market share reached 72.7% according to Bloomberg Online. On January 8, 2004, Hewlett-Packard (HP) announced that they would sell HP-branded iPods under a license agreement from Apple. Several new retail channels were used—including Walmart—and these iPods eventually made up 5% of all iPod sales. In July 2005, HP stopped selling iPods due to unfavorable terms and conditions imposed by Apple. On April 9, 2007, it was announced that Apple had sold its one-hundred millionth iPod, making it the biggest selling digital music player of all time. In April 2007, Apple reported second quarter revenue of US$5.2 billion, of which 32% was made from iPod sales. Apple and several industry analysts suggest that iPod users are likely to purchase other Apple products such as Mac computers. On October 22, 2007, Apple reported quarterly revenue of US$6.22 billion, of which 30.69% came from Apple notebook sales, 19.22% from desktop sales and 26% from iPod sales. Apple's 2007 year revenue increased to US$24.01 billion with US$3.5 billion in profits. Apple ended the fiscal year 2007 with US$15.4 billion in cash and no debt. On January 22, 2008, Apple reported the best quarter revenue and earnings in Apple's history so far. Apple posted record revenue of US$9.6 billion and record net quarterly profit of US$1.58 billion. 42% of Apple's revenue for the First fiscal quarter of 2008 came from iPod sales, followed by 21% from notebook sales and 16% from desktop sales. On October 21, 2008, Apple reported that only 14.21% of total revenue for fiscal quarter 4 of year 2008 came from iPods. At the September 9, 2009 keynote presentation at the Apple Event, Phil Schiller announced total cumulative sales of iPods exceeded 220 million. The continual decline of iPod sales since 2009 has not been a surprising trend for the Apple corporation, as Apple CFO Peter Oppenheimer explained in June 2009: "We expect our traditional MP3 players to decline over time as we cannibalize ourselves with the iPod Touch and the iPhone." Since 2009, the company's iPod sales have continually decreased every financial quarter and in 2013 a new model was not introduced onto the market. As of September 2012[update], Apple reported that total number of iPods sold worldwide was 350 million. iPods have won several awards ranging from engineering excellence,[not in citation given] to most innovative audio product, to fourth best computer product of 2006. iPods often receive favorable reviews; scoring on looks, clean design, and ease of use. PC World says that iPod line has "altered the landscape for portable audio players". Several industries are modifying their products to work better with both the iPod line and the AAC audio format. Examples include CD copy-protection schemes, and mobile phones, such as phones from Sony Ericsson and Nokia, which play AAC files rather than WMA. Besides earning a reputation as a respected entertainment device, the iPod has also been accepted as a business device. Government departments, major institutions and international organisations have turned to the iPod line as a delivery mechanism for business communication and training, such as the Royal and Western Infirmaries in Glasgow, Scotland, where iPods are used to train new staff. iPods have also gained popularity for use in education. Apple offers more information on educational uses for iPods on their website, including a collection of lesson plans. There has also been academic research done in this area in nursing education and more general K-16 education. Duke University provided iPods to all incoming freshmen in the fall of 2004, and the iPod program continues today with modifications. Entertainment Weekly put it on its end-of-the-decade, "best-of" list, saying, "Yes, children, there really was a time when we roamed the earth without thousands of our favorite jams tucked comfortably into our hip pockets. Weird." The iPod has also been credited with accelerating shifts within the music industry. The iPod's popularization of digital music storage allows users to abandon listening to entire albums and instead be able to choose specific singles which hastened the end of the Album Era in popular music. iPod batteries are not designed to be removed or replaced by the user, although some users have been able to open the case themselves, usually following instructions from third-party vendors of iPod replacement batteries. Compounding the problem, Apple initially would not replace worn-out batteries. The official policy was that the customer should buy a refurbished replacement iPod, at a cost almost equivalent to a brand new one. All lithium-ion batteries lose capacity during their lifetime even when not in use (guidelines are available for prolonging life-span) and this situation led to a market for third-party battery replacement kits. Apple announced a battery replacement program on November 14, 2003, a week before a high publicity stunt and website by the Neistat Brothers. The initial cost was US$99, and it was lowered to US$59 in 2005. One week later, Apple offered an extended iPod warranty for US$59. For the iPod Nano, soldering tools are needed because the battery is soldered onto the main board. Fifth generation iPods have their battery attached to the backplate with adhesive. The first generation iPod Nano may overheat and pose a health and safety risk. Affected iPod Nanos were sold between September 2005 and December 2006. This is due to a flawed battery used by Apple from a single battery manufacturer. Apple recommended that owners of affected iPod Nanos stop using them. Under an Apple product replacement program, affected Nanos were replaced with current generation Nanos free of charge. iPods have been criticized for alleged short lifespan and fragile hard drives. A 2005 survey conducted on the MacInTouch website found that the iPod line had an average failure rate of 13.7% (although they note that comments from respondents indicate that "the true iPod failure rate may be lower than it appears"). It concluded that some models were more durable than others. In particular, failure rates for iPods employing hard drives was usually above 20% while those with flash memory had a failure rate below 10%. In late 2005, many users complained that the surface of the first generation iPod Nano can become scratched easily, rendering the screen unusable. A class-action lawsuit was also filed. Apple initially considered the issue a minor defect, but later began shipping these iPods with protective sleeves. On June 11, 2006, the British tabloid The Mail on Sunday reported that iPods are mainly manufactured by workers who earn no more than US$50 per month and work 15-hour shifts. Apple investigated the case with independent auditors and found that, while some of the plant's labour practices met Apple's Code of Conduct, others did not: employees worked over 60 hours a week for 35% of the time, and worked more than six consecutive days for 25% of the time. Foxconn, Apple's manufacturer, initially denied the abuses, but when an auditing team from Apple found that workers had been working longer hours than were allowed under Chinese law, they promised to prevent workers working more hours than the code allowed. Apple hired a workplace standards auditing company, Verité, and joined the Electronic Industry Code of Conduct Implementation Group to oversee the measures. On December 31, 2006, workers at the Foxconn factory in Longhua, Shenzhen formed a union affiliated with the All-China Federation of Trade Unions, the Chinese government-approved union umbrella organization. In 2010, a number of workers committed suicide at a Foxconn operations in China. Apple, HP, and others stated that they were investigating the situation. Foxconn guards have been videotaped beating employees. Another employee killed himself in 2009 when an Apple prototype went missing, and claimed in messages to friends, that he had been beaten and interrogated. As of 2006, the iPod was produced by about 14,000 workers in the U.S. and 27,000 overseas. Further, the salaries attributed to this product were overwhelmingly distributed to highly skilled U.S. professionals, as opposed to lower-skilled U.S. retail employees or overseas manufacturing labor. One interpretation of this result is that U.S. innovation can create more jobs overseas than domestically. ^ Costello, Sam (October 13, 2015). "This is the Number of iPods Sold All-Time". Lifewire. Retrieved May 6, 2017. ^ "What Is an Ipod? How Does the iPod Work? How to Use an iPod". askdeb.com. August 7, 2016. ^ Pierce, David (July 27, 2017). "Goodbye iPod, and Thanks for All the Tunes". Wired. Retrieved August 6, 2017. ^ Apple Inc. "iTunes system requirements. Apple iTunes software runs on Mac OS X 10.3.9 or OS X 10.4.9 or later and on Microsoft Windows XP (Service Pack 2) or later". Retrieved May 28, 2008. ^ McKillop, Ross (July 8, 2007). "10 Alternatives to iTunes for managing your iPod". Simple Help. Retrieved May 28, 2008. ^ "APPLE IOS 5 IPHONE / IPAD HANDS-ON (screenshot of iPhone home screen with iOS 5 preview)". Boy Genius Report. June 6, 2011. Retrieved June 6, 2011. ^ Horace Dediu (October 21, 2010). "Turning up the volume: iPhone overtakes iPod". asymco. Retrieved October 25, 2013. ^ "Instant Expert: A Brief History of iPod". iLounge Article. Retrieved June 13, 2013. ^ a b c d e Kahney, Leander.Straight Dope on the iPod's Birth, Wired News, October 17, 2006. Retrieved on October 30, 2006. ^ "2007 Engineer of the Year Finalist Michael Dhuey's Hardware Knowledge Helps Breathe Life Into iPod, TelePresence". Design News. September 24, 2007. Archived from the original on October 12, 2007. ^ Sorrel, Charlie (May 13, 2011). "Gallery of Gadgets Which Inspired Modern Day Tech". Wired. Retrieved May 1, 2014. ^ Carr, Austin (November 6, 2013). "Apple's Inspiration For The iPod? Bang & Olufsen, Not Braun". Fast Company. Retrieved May 1, 2014. ^ "A History of the iPod: 2000 to 2004". Lowendmac.com. Retrieved August 15, 2011. ^ "Apple Introduces the New U2 iPod". Apple, Inc. June 6, 2006. Retrieved January 18, 2014. ^ "Apple Computer iPod U2 Special Edition (with video)". iLounge Article. June 9, 2006. Retrieved January 18, 2014. ^ a b Boffey, Daniel Apple admit Briton DID invent iPod, but he's still not getting any money Daily Mail, September 8, 2008. Retrieved on September 8, 2008. ^ “Open the pod bay doors, HAL.” - Thisdayinquotes.com, April 2, 2017. ^ Serial No. 78018061, Registration No. 2781793, records of the U.S. Patent and Trademark Office. InPub, LLC, filed an "IPOD" trademark on June 1, 1999, for "computer software and hardware." The trademark was abandoned May 18, 2000, without commercial use. ^ "Ipod by Chrysalis Incorporated". Trademarkia. Retrieved December 20, 2011. ^ "iTunes 12.2 update indicates new gold, dark blue, dark pink iPod nano, touch + shuffle colors". 9TO5Mac. July 1, 2015. Retrieved July 4, 2015. ^ Colleau, Alexandre (July 1, 2015). "Exclu : iTunes 12.2 révèle les futurs iPod". Belgium iPhone (in French). Retrieved July 4, 2015. ^ "Goodbye iPod, and Thanks for All the Tunes". WIRED. Retrieved 2017-08-01. ^ Cassell, Jonathan. Apple Delivers More For Less With New iPod Nano, iSuppli Corporation, September 20, 2006. Retrieved on October 21, 2006. ^ "mobile SoC". Samsung Group. Archived from the original on February 25, 2008. Retrieved August 4, 2009. ^ Williams, Martyn. How Much Should an IPod Shuffle Cost?, PC World, February 24, 2005. Retrieved on August 14, 2006. ^ "iPod nano Technical Specifications". Apple Inc. Retrieved January 27, 2013. ^ "iPod classic Technical Specifications". Apple Inc. Retrieved August 4, 2009. ^ "iPod touch Technical Specifications". Apple Inc. Retrieved January 27, 2013. ^ a b Machrone, Bill. iPod audio measurements Archived December 20, 2012, at Archive.today, PC Magazine, 2005. Retrieved on February 17, 2007. ^ Heijligers, Marc. iPod audio measurements. Retrieved on February 17, 2007. ^ Heijligers, Marc. iPod circuit design engineering Archived May 5, 2006, at the Wayback Machine, May 2006. Retrieved on February 17, 2007. ^ Vaughan, Austin. "Tweaking the iPod equalizer". Archived from the original on September 23, 2012. , DAP review, November 8, 2004. Retrieved on September 14, 2012. ^ Handby, Simon. "Apple iPod 60GB review". Archived from the original on September 23, 2012. , Expert Reviews, December 19, 2005. Retrieved on September 14, 2012. ^ Cohen, Peter. iPod update limits iPod volume setting, Macworld, 2006. Retrieved on November 7, 2008. ^ Fried, Ian. Apple pulls iPod in France. Retrieved on November 7, 2008. ^ "New Option to turn off EU Volume Cap? - Official Apple Support Communities". discussions.apple.com. ^ "Traffic's review of Apple iPod classic 160 GB Black - 7th Gene..." www.amazon.co.uk. Archived from the original on 2016-10-11. ^ "Why Can't I Update My Ipod Classic to 2.0.5 - Communities". discussions.apple.com. ^ Johnson, Joel (July 10, 2008). "How the "Apple Tax" Boosts Prices on iPod & iPhone Accessories". Popular Mechanics. Archived from the original on August 17, 2008. Retrieved September 9, 2008. ^ In-The-Ear Bluetooth Earphones. Retrieved on February 17, 2007. ^ iPod Your BMW. Retrieved on February 17, 2007. ^ Apple & Mercedes-Benz Unveil iPod Integration Kit Archived May 21, 2011, at the Wayback Machine, Apple Inc., January 11, 2005. Retrieved on June 20, 2006. ^ Apple & Volvo Announce iPod Connectivity For Entire 2005 US Model Line Archived March 29, 2011, at the Wayback Machine, Apple Inc., January 11, 2005. Retrieved on June 20, 2006. ^ "Toyota introduce iPod integration kit". Gizmag.com. September 4, 2007. Retrieved June 2, 2010. ^ Apple & Leading Car Companies Team Up to Deliver iPod Integration in 2005 Archived May 7, 2011, at the Wayback Machine, Apple Inc., January 11, 2005. Retrieved on June 20, 2006. ^ Honda Music Link for iPods, Honda. Retrieved on February 17, 2007. ^ "Your iPod just called shotgun". apple.com. Retrieved June 4, 2015. ^ Apple Teams Up With Acura, Audi, Honda & Volkswagen to Deliver Seamless iPod Experience Archived May 21, 2011, at the Wayback Machine, Apple Inc., September 7, 2005. Retrieved on June 20, 2006. ^ Car Integration: iPod your car Archived August 20, 2014, at the Wayback Machine, Apple Inc.. Retrieved on February 17, 2007. ^ Apple Teams Up With Continental, Delta, Emirates, & United to deliver iPod Integration Archived June 24, 2011, at the Wayback Machine, Apple Inc., November 14, 2006. Retrieved on December 7, 2006. ^ Marsal, Katie. Two of six airlines say there's no ink on iPod deal, AppleInsider, November 15, 2006. Retrieved on December 7, 2006. ^ The restrictions vary from generation to generation; for the earliest video iPods, video is required to be Baseline Profile (BP), up to Level 1.3, meaning most significantly no B-frames (BP), a maximum bitrate of 768 kb/s (BP Level 1.3), and a maximum framerate of 30 frame/s at 320×240 resolution. Newer iPods support BP up to level 3.0 (10,000 kb/s), for a maximum framerate of 30 frame/s at 640×480 resolution. Current specifications can be seen at iPod classic Technical Specs, and practical implementations can be seen in the libx264-ipod320.ffpreset and libx264-ipod640.ffpreset preset files for FFmpeg, as discussed in [Ffmpeg-user] Successful ipod h264 encoding Archived August 26, 2010, at the Wayback Machine, by Daniel Rogers, June 11, 2006. ^ "iTunes Downloads". Apple.com. February 7, 2008. Retrieved August 15, 2011. ^ iTunes Music Store Catalog Tops One Million Songs Archived February 9, 2006, at the Wayback Machine, Apple Inc., August 10, 2004. Retrieved on December 28, 2006. ^ Scott-Joynt, Jeremy. Apple targets TV and film market, BBC News, September 12, 2006. Retrieved on September 12, 2006. ^ Kanellos, Michael (March 23, 2004). "Real's Glaser exhorts Apple to open iPod". CNET News. Retrieved December 20, 2011. ^ Hansell, Saul (August 11, 2008). "The iTunes Store: Profit Machine". August 11, 2008. Retrieved December 20, 2011. ^ Evans, Jonny. Universal confirms iTunes contract change, Macworld UK, July 4, 2007. Retrieved on July 5, 2007. ^ "iPod Games Review Roundup". Gamepro.com. September 15, 2006. Archived from the original on June 7, 2011. Retrieved August 15, 2011. ^ "What's Inside an iPod Game?" bensinclair.com, September 14, 2006. ^ "iPod touch: Appears in iTunes but not in Finder or Windows Desktop". Docs.info.apple.com. January 6, 2010. Retrieved August 15, 2011. ^ —Gina Trapani (May 14, 2007). "How To: Boot up your Mac from your iPod". Lifehacker.com. Retrieved August 15, 2011. ^ "Restore iPod – Format iPod – Reformat iPod – iPod Restore Software". Ipod.about.com. February 1, 2010. Retrieved June 2, 2010. ^ a b "Apple discontinues iPod nano and shuffle". 9to5Mac. 27 July 2017. Retrieved 27 July 2017. ^ "iPhone and iPod touch: Charging the battery". Apple Inc. October 15, 2009. Retrieved January 12, 2010. ^ "Apple Introduces The Best iPod touch Yet" (Press release). Cupertino, California: Apple. July 15, 2015. Retrieved 2015-07-17. ^ Apple Inc., Identifying iPod models, retrieved October 31, 2007. ^ a b Mactracker (mactracker.ca), Apple Inc. model database, version as of July 26, 2007. ^ Apple faces patent lawsuits over its iPod, ChannelRegister, March 10, 2005. Retrieved on February 17, 2007. ^ U.S. Patent 6,587,403 — Advanced Audio Devices' "music jukebox" patent. ^ U.S. Patent 6,665,797 — "Protection of software again against unauthorized use" (corrected to "Computer Apparatus/Software Access Control"). ^ Apple, Sony among those named in new DRM lawsuit, AppleInsider, August 16, 2005. Retrieved on February 17, 2007. ^ U.S. patent application 20030095096 Apple Inc.'s application on "rotational user inputs". ^ U.S. Patent 6,928,433 Creative Technology's "Zen" patent. ^ Creative wins MP3 player patent, BBC News, August 30, 2005. Retrieved on February 17, 2007. ^ McMillan, Robert (May 16, 2006). "Creative sues Apple over patent". MacWorld. Mac Publishing. Retrieved April 30, 2012. ^ Apple & Creative Announce Broad Settlement... Archived June 9, 2011, at the Wayback Machine, Apple Inc.. Retrieved on February 17, 2007. ^ Marsal, Katie. iPod: how big can it get?, AppleInsider, May 24, 2006. Retrieved on February 17, 2007. ^ HP to stop selling Apple's iPods, AppleInsider, July 29, 2005. Retrieved on August 6, 2007. ^ "Apple Reports First Quarter Results". Apple Press Info. January 17, 2007. ^ "Apple Reports Second Quarter Results". Apple Press Info. April 25, 2007. ^ "Study: iPod users to switch for iPhone". MacNN. May 16, 2007. ^ Apple Reports Fourth Quarter 2007 Results Archived May 17, 2008, at the Wayback Machine, Apple Inc., October 22, 2007. Retrieved on October 22, 2007. ^ Sean Hollister (January 27, 2014). "The age of the iPod is over". The Verge. Vox Media, Inc. Retrieved January 30, 2014. ^ Costello, Sam (September 2012). "Total Number of iPods Sold All-Time". About.com. Retrieved March 19, 2013. ^ iPod and Bluetooth lead to prizes, BBC News, June 3, 2005. Retrieved on March 20, 2007. ^ Apple wins 5 'World Class' awards, MacNN. Retrieved on February 17, 2007. ^ Apple, iPod, and CD Copy Protection, MacRumors. Retrieved on February 17, 2007. ^ Hospitals train staff with iPods, BBC News, March 29, 2006. Retrieved on June 16, 2007. ^ "Mobile Learning". Apple.com. Archived from the original on March 2, 2010. Retrieved August 15, 2011. ^ Maag, M.E.D. (2006). "Podcasting and MP3 players: emerging education technologies". CIN: Computers, Informatics, Nursing. 24 (1): 9–13. PMID 16436906. Retrieved February 8, 2008. ^ "Pedagogies afforded by new technologies: The introduction of iPods in one secondary school" (PDF). ^ — Doug Lederman. "Duke's Ever-Evolving iPod Initiative". Insidehighered.com. Retrieved August 15, 2011. ^ Tejas Morey. "How iTunes Changed The Music Industry Forever." MensXP (Times of India). Retrieved January 5, 2014. ^ MP3 Insider: The truth about your battery life Archived June 4, 2006, at the Wayback Machine, mp3.com, March 13, 2006. Retrieved on July 10, 2006. ^ Apple investigates iPod batteries, BBC News, February 10, 2004. Retrieved on March 20, 2007. ^ Horwitz, Jeremy. Apple’s iPod Battery Settlement, Explained, iLounge, June 10, 2005. Retrieved on August 27, 2006. ^ Kaufman, Gill (2 June 2005). "THAT IPOD BATTERY PROBLEM? APPLE STEPS UP TO SOLVE IT". MTV. Retrieved 21 February 2019. ^ The Curse of Lithium Ion Batteries, MP3 Newswire, January 6, 2006. Retrieved on November 30, 2006. ^ iPod Battery FAQ. Retrieved on November 26, 2006. ^ Neistat, Casey. A Message From the Neistat Brothers, November 20, 2003. Retrieved on February 17, 2007. ^ Apple offers iPod battery replacement service Archived October 22, 2004, at the Wayback Machine, MacMinute, November 14, 2003. Retrieved on November 26, 2006. ^ AppleCare for iPod now available Archived October 22, 2004, at the Wayback Machine, MacMinute, November 21, 2003. Retrieved on November 26, 2006. ^ Ecker, Clint. Vivisection of the Video iPod, Ars Technica, October 19, 2005. Retrieved on November 26, 2006. ^ Disassemble Guide for Video iPod. Retrieved on November 26, 2006. ^ "Apple opens up replacement program for first-gen iPod nano". Apple Insider. November 12, 2011. Retrieved December 20, 2011. ^ iPod Reliability Survey, MacInTouch, November 28, 2005. Retrieved on October 29, 2006. ^ Apple responds to iPod nano screen concerns, Macworld, September 27, 2005. Retrieved on February 17, 2007. ^ Arthur, Charles. iPod Nano owners in screen scratch trauma, The Register, September 25, 2005. Retrieved on February 17, 2007. ^ Fried, Ina. Suit filed over Nano scratches, CNet News, October 21, 2005. Retrieved on February 17, 2007. ^ Inside Apple's iPod factories, Macworld UK, June 12, 2006. Retrieved on March 20, 2007. ^ Millard, Elizabeth. Is It Ethical To Own an iPod?. Retrieved on March 20, 2007. ^ Foxconn denies iPod 'sweatshop' claims, MacNN, June 19, 2006. Retrieved on February 17, 2007. ^ ITUC Hong Kong Liaison Office (January 2, 2007). "ACFTU Union established at Foxconn on the very last day of 2006". Retrieved February 2, 2010. ^ McDonald's and KFC seeking to resolve Chinese minimum wage issue ..., April 5, 2007, nytimes.com. Retrieved 2010 5 27. ^ Freeland, Chrystia (July 1, 2011). "Winners and Losers in the Apple Economy". Blogs.reuters.com. Retrieved August 15, 2011. ^ Apple Inc., Apple press release library, Retrieved September 19, 2007. 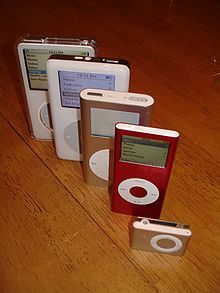 Wikimedia Commons has media related to iPod. iPod – official site at Apple Inc.
iPod troubleshooting basics and service FAQ at Apple Inc.